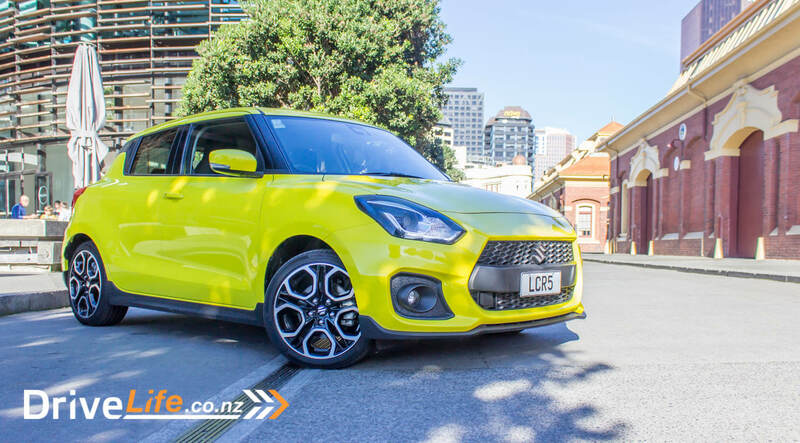 2018 Suzuki Swift Sport – New Car Review – is it Leaner, Meaner, Swifter? Whoever invented the Suzuki Swift car game should be shot. For those who don’t know, this is a kids’ car game. So when you are in the car with someone else and you see a Suzuki Swift, you punch the other person’s arm. It’s like the Yellow Car game, but you get hit more. 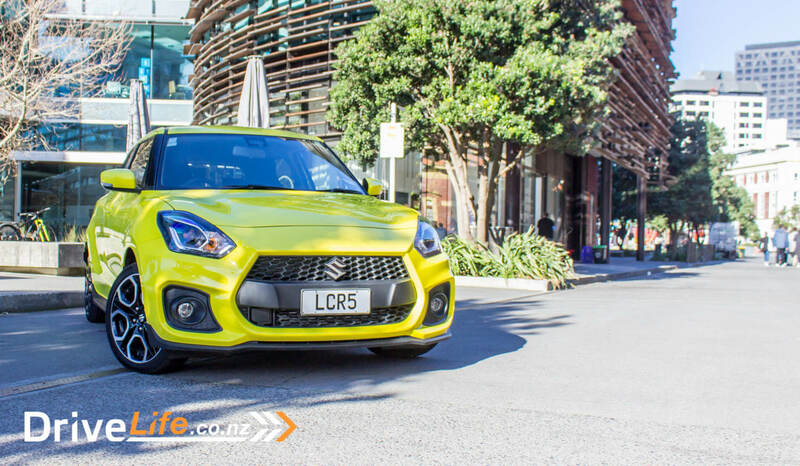 This is because there are a lot more Suzuki Swifts than there are yellow cars. 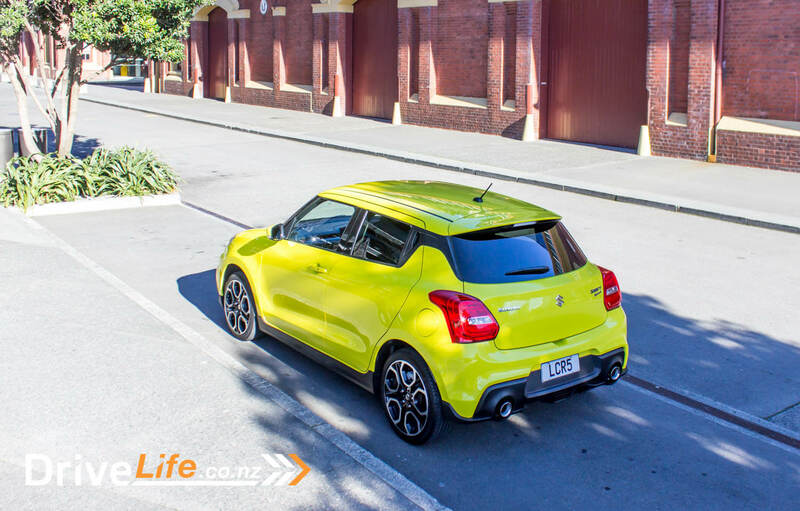 Everywhere you go, New Zealanders seem to love the Swift. 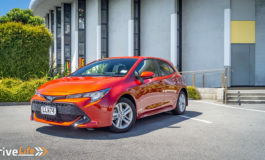 And with good reason – they are a great-driving little runabout, and did very well in our $20K Challenge a few years back, almost beating the Skoda Fabia to the top spot. Of course, we now have the new, 4th generation Swift – freshened-up design, new motors, new interior and 90Kg less weighty. Rob tested the RS model last year and wasn’t that impressed with it. Can the new Swift Sport model win hearts like the ‘old’ model did? 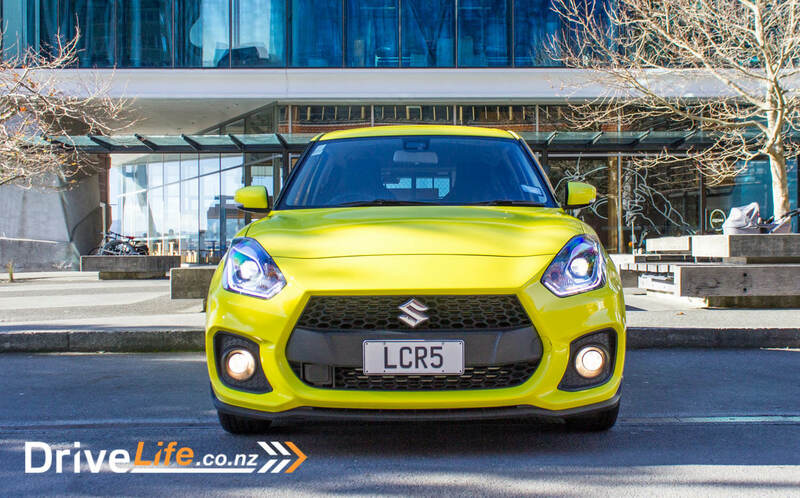 Suzuki New Zealand sent us a Swift Sport to find out. There’s four models to choose from here, with a mix of automatics and manuals thrown in. 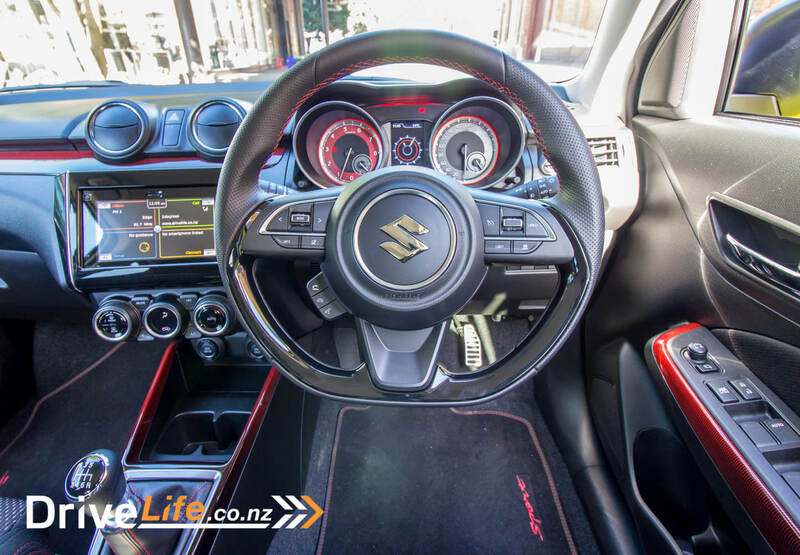 Great stuff Suzuki, still having manual cars – even our test Swift Sport was a manual. At the base of the range is the GL model, in both 5-speed manual (at just $19,990, too) and CVT automatic at $21,990. These are both fitted with a 1.2-litre petrol motor, which manages 66kW of power and 120Nm of torque. 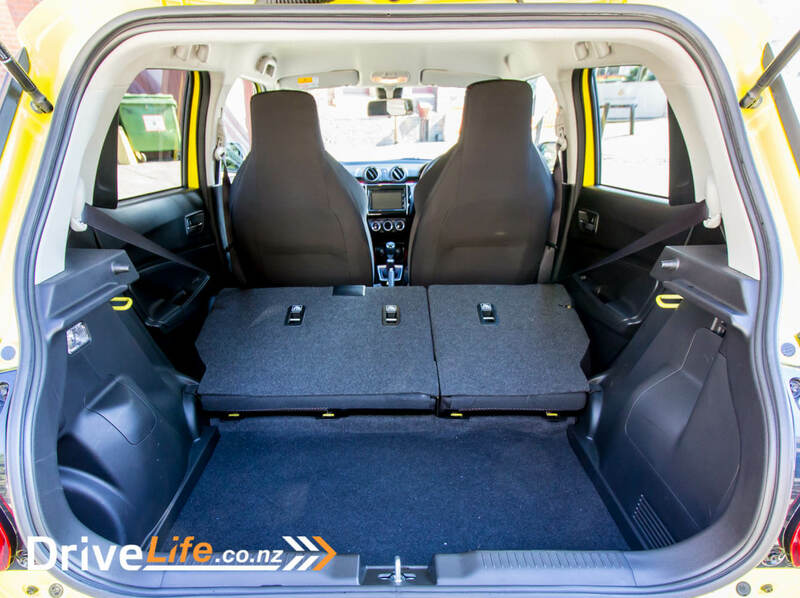 At just 870Kg, the Swift GL is a lightweight car. Next up is the CVT-only GLX hatchback – same motor, but a different trim level, and priced at $24,500. 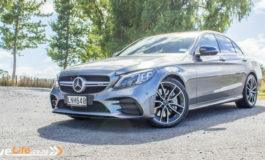 In the middle of the range is the $25,990 RS model, that has a 1.0-litre, three-cylinder turbo-petrol motor and a 6-speed auto transmission – no manual option here. This motor puts out 82kW of power and a decent 160Nm of torque. Top of the range is the Sport, either in 6-speed manual ($28,500) or 6-speed auto ($29,990). Both are fitted with Suzuki’s excellent 1.4-litre, 4-cylinder BoosterJet turbo-petrol motor we last saw in the S-Cross. It has an output of 103kW of power and an excellent 230Nm of torque – in a car that weighs in at 970Kg. Feature-wise, the base GL model is fairly basic, but then it is under $20K. The manual model comes with electric windows, power mirrors, cruise control, tilt steering wheel, Bluetooth, leather steering wheel, body-coloured mirrors, rear privacy glass, LED DRLs, 15” steel wheels. The CVT GL adds some extras to this, like SatNav, a reversing camera, also Apple CarPlay and Android Auto. Weirdly the CVT has a 5-star ANCAP rating, while I presume the manual is a 4-star – it isn’t stated. As you would imagine, the CVT-only GLX ups the ante, with 16” alloy wheels, adaptive cruise control, weaving alert (that’s weaving in your lane, not the other sort), and lane departure warning. The auto-only RS definitely adds more value at $25,990, with a telescoping steering wheel, electrically folding mirrors, keyless entry and start, a six-speaker audio system, climate AC with a pollen filter, paddle shifters, LED projector headlamps, auto on and auto levelling headlamps, 16” polished alloys, and auto high beam assist. So, to the Sport at just $28,500 for the manual. On top of this, it adds alloy pedals, sports seats, 17” alloys, twin exhausts, and a rear upper spoiler – plus that lovely engine of course. Wow – as I went to pick up our test car, well let’s just say it stood out from the sea of boring grey and silver cars. 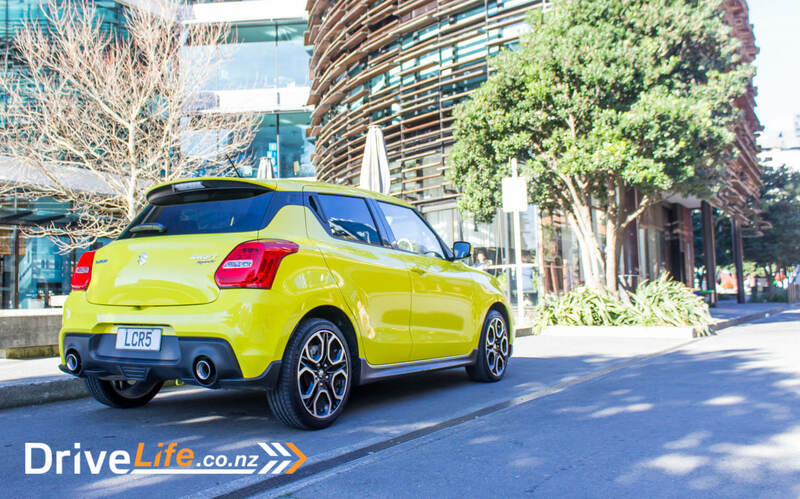 This Champion Yellow colour has been in the Swift Sport range for over ten years, and it still looks great – and suits the Swift perfectly. This yellow is only available on the Sport model, so if you see a Yellow Swift, you know it’s the Sport version instantly. A quick glance in the window of the car showed my second nice surprise – Suzuki had sent us a manual model! This test had already started well. 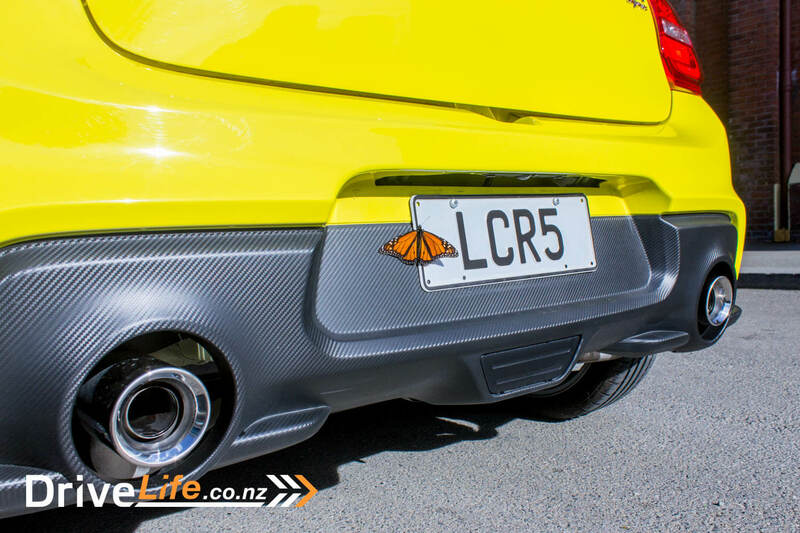 Looking at the back of the car, those twin exhausts look awesome. It’s a trademark Swift Sport look, and they do it well. While the shape is distinctly Swift, Suzuki have done an excellent job of updating it without losing anything. It’s still fresh, fun and funky – especially in yellow – and will keep buyers happy. I had not long dropped off a Subaru Outback test car, so after that it was like getting into a sports car. It’s not super low-down, but it feels it. While I love the yellow paint, the red interior trim on the Sports model does seem to clash some. 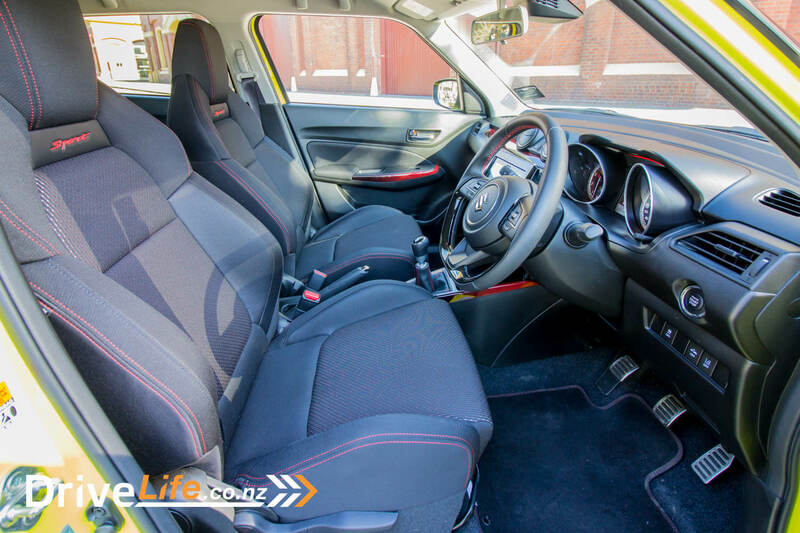 The seats and carpets are black, the headlining is beige, but there’s quite a bit of sporty red plastic trim dotted around the cabin, and also red stitching on the seats, gear change boot, mats and steering wheel. I love contrasting stitching in car interiors, but the red with the yellow was a bit hard on the eyes. 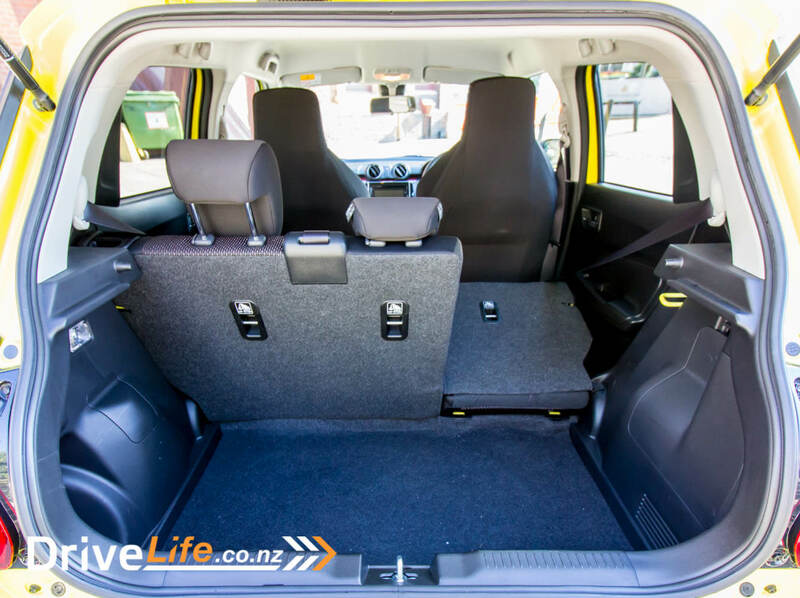 While feeling sporty – especially with those high-backed front seats – the cabin can feel a bit sparse when looking at it. 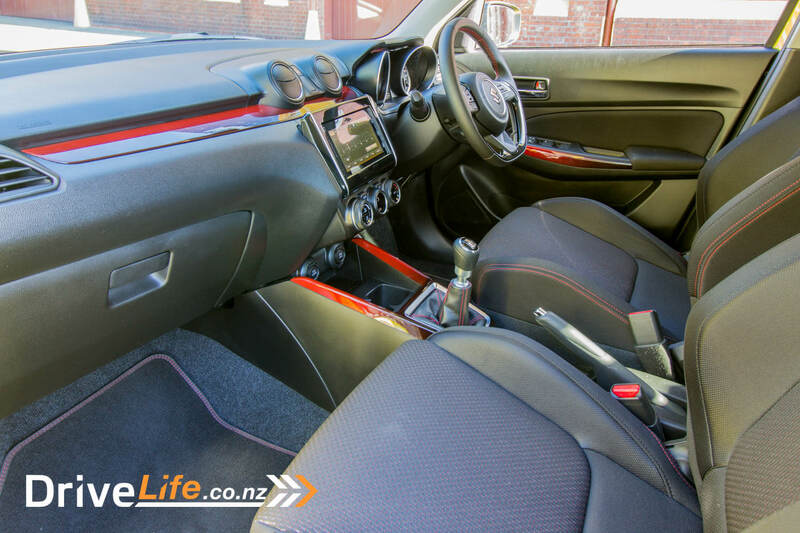 There’s also lots of hard black plastic about the cabin – and then you remember this car is only $28,500. For me, the only ‘real’ extras are climate AC and adaptive cruise control, but hey for the money, just having adaptive cruise is a huge bonus. I could mention a number of cars that cost over $60K – and some at over $80K – that don’t have adaptive cruise. Sitting in the driver’s seat, the rev counter has a full-on red background, and the instrument cluster itself has a glowing red line around it. If that doesn’t scream ‘sporty’ to you, then the flat-bottom steering wheel and alloy pedals just might. There’s a manual handbrake in the usual place, and up front is a 7” central touchscreen display. 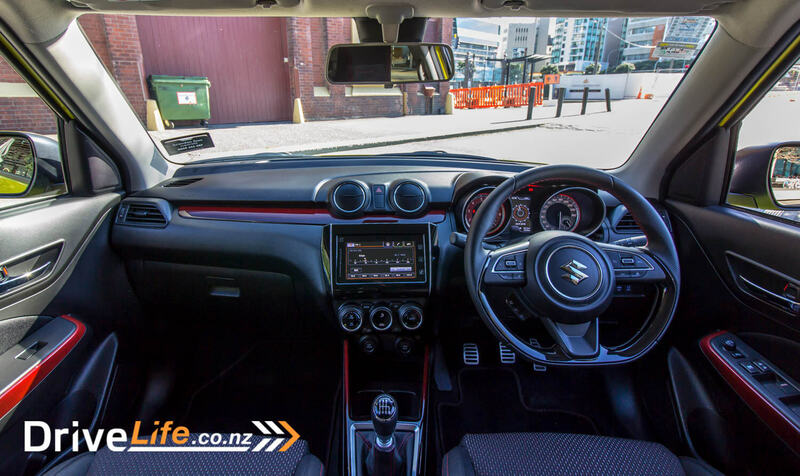 This uses Suzuki’s usual infotainment system, and it works very well, with a clean and crisp display. So simple to use, even some of the older generations will work it with ease. Or they can always ask their grandchildren. There’s no volume knob anywhere, it’s either use the steering wheel controls or the slider. Actually, there’s no buttons at all in the centre of the car, except for the air con controls. Up front there’s a single USB port, as well as a 12V power socket and an AUX port. 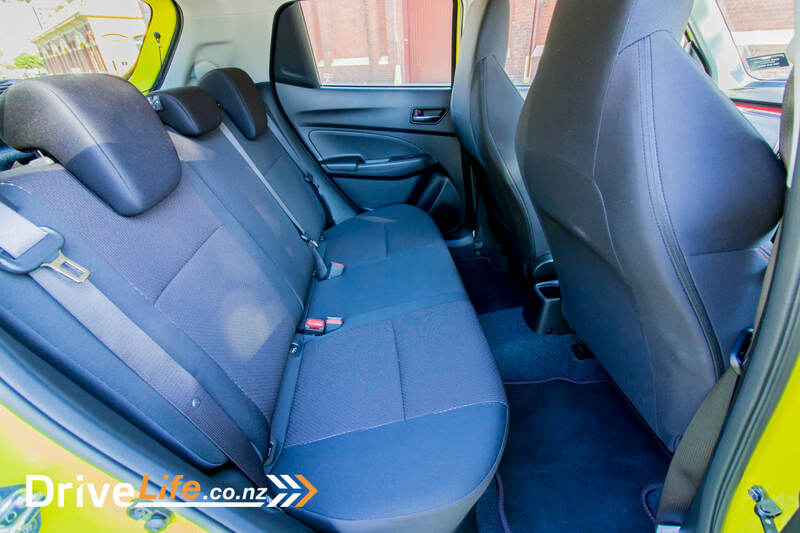 Behind you is a 60/40 split rear seat, and rear legroom is actually pretty good, considering this is a short car. The boot is quite deep, but short. There’s no spare tyre here, but a puncture sealant kit instead. 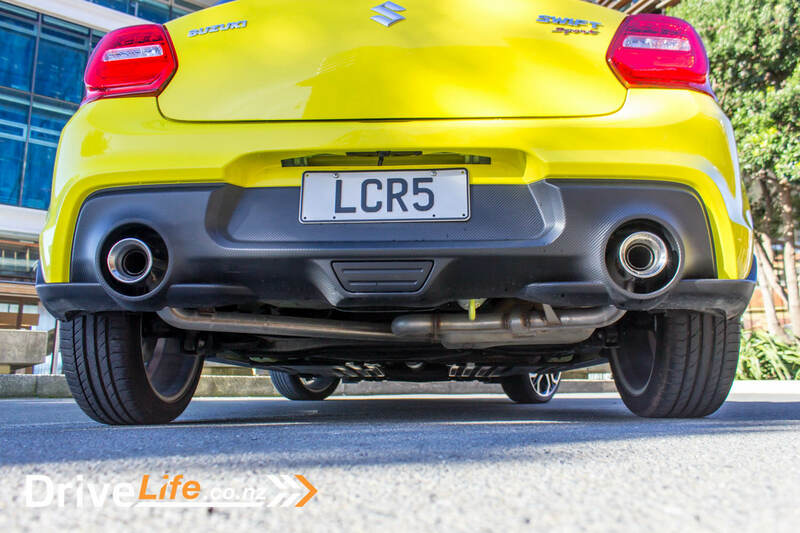 Unfortunately – and this isn’t only a Suzuki thing – there’s a huge piece of polystyrene in place of a spare. The thing is there’s still so much wasted space here, it almost seems pointless to not have a spare. A better design here would work wonders, and would allow a lot more storage for all that crap we haul around in our boots (and never use). I did like that when you go to close the boot, there’s a pull handle on either side. Simple thing, but having it only on one side – which is the norm – is a bit of a pain at times. I don’t recall seeing this before, but have wanted some manufacturer to do this. 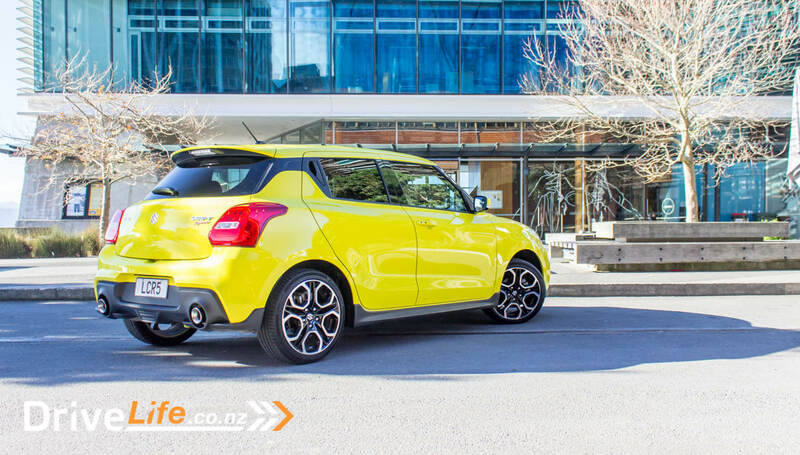 The Swift Sport has always been about the Fun Drive. Does the new model deliver on that promise? 100%. We loved the 1.4 BoosterJet engine in the S-Cross. Take that engine, stick a 6-speed manual gearbox on it in a car weighing in at 970Kg and you have the recipe for a totally Fun Drive. Incredibly torquey, and with that light weight, always a blast and always – always – so easy to drive. 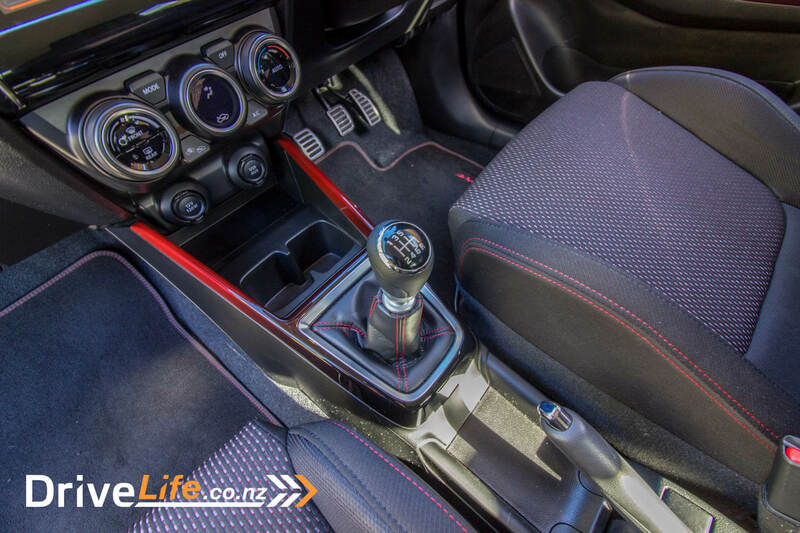 While some might poo-poo the manual gearbox, with the mixture of weight and torque, you don’t really need to change gear much anyway. Dare I say it – this gearbox in this car with that engine makes a mockery of owning an automatic, even in a city. 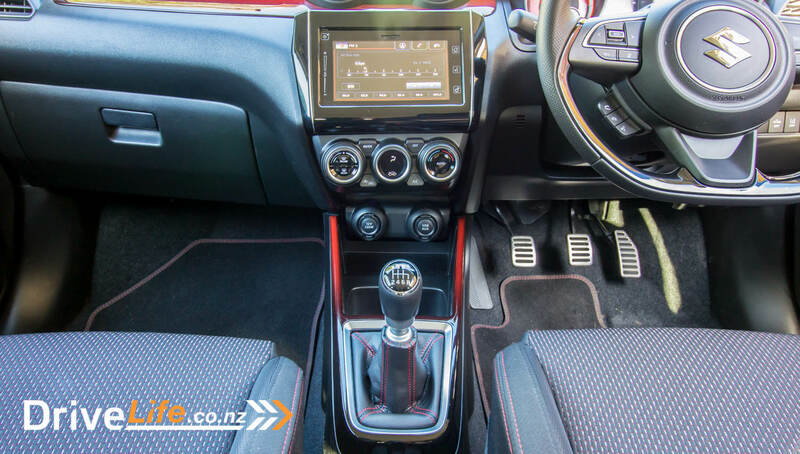 Don’t get me wrong – there’s nothing wrong with Suzuki’s 6-speed auto ‘box – it is excellent – but in this car, a manual is the way to go. It’s just so easy to tootle around town in 5th gear, and accelerate away cleanly and crisply. Often I went straight from 4th to 6th gear without hesitation; the engine can handle this very comfortably. Needless to say, with the light weight and 103kW of power, this car can really move it. Full-throttle acceleration will see plenty of wheel spin and axle tramp, but it still gets away quickly. Accelerating just that little bit too hard through a corner will also return wheel spin, in a nice, controllable way. I don’t think I can say it enough – this is a brilliant, fun car to drive. So when you hear the name ‘Sport’, you would assume that not only can it accelerate quickly, it can also handle a twisty road, right? I took the Sport to my Favourite Handling Road to test it out. All in the name of fair reporting, of course. Being a weekday, there was almost no traffic about as the Swift and I tested out its handling, braking, cornering. I’ve got to mention that torquey engine again – it makes it so much easier. Sure, you can change down to second gear for a tight corner, but there’s no need; leave it in third, and let the torque of the engine send you out of the corner. As I got further along using a higher gear, I tried using fourth gear instead. It was almost as good as third. Sure, I didn’t get much engine braking coming into a corner, but even relatively sharper bends at 20 to 30km/h could be taken in fourth, and the Swift would easily accelerate cleanly out the other side. Cornering isn’t quite flat, but it’s pretty darn close. I have no complaints in the handling department, other than too much wheel spin if you do use lower gears and come out of a bend with too much gas. 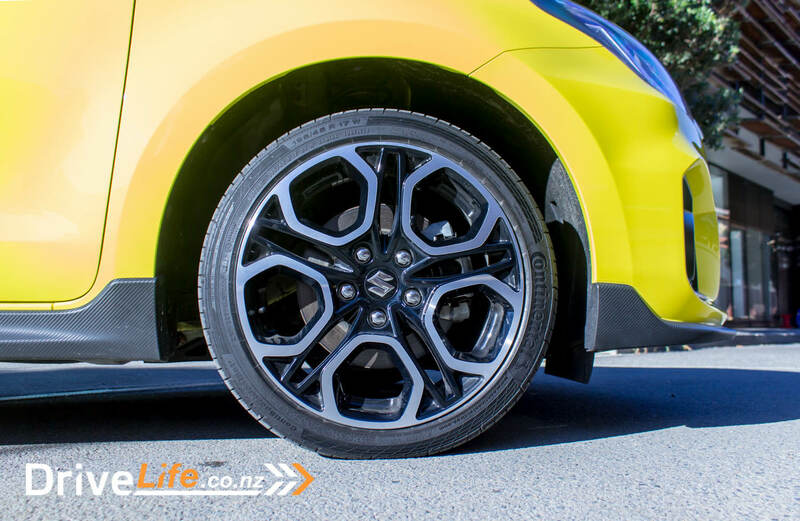 Brakes too are a dream here – with a manual gearbox and light weight, they don’t need to do much, but they are up to the task anyway; good feedback and easily modulated. Spot on. Steering as well – excellent. Great feedback through the wheel at all times. 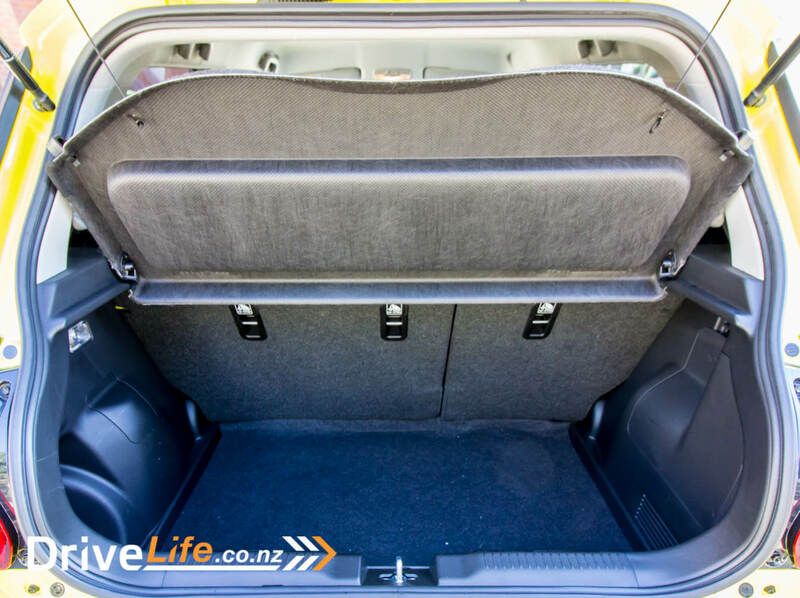 This road also showed how good those sports seats are – they have excellent side support and just the right padding in just the right places. Perfect. Over my week with the Swift Sport and especially on that twisty road, it reminded me of some classics, past and recent, like the MX-5, or even an original Golf GTi. So much fun, and the driver gets really involved with actually driving the car. Couldn’t ask for more than that. I have to say, the pedals weren’t quite right for me for heel-and-toe gear changes, but after a week with the car I had it sorted, but it would have been even better if they were adjustable. Okay, enough going on about just how good the engine/handling/steering/brakes are on a twisty road – what about using the Swift Sport as a Daily Driver? In my notes, I kept writing the word ‘excellent’ next to anything I was describing. And yes, it’s excellent as a daily driver, in general. One example of this is the adaptive cruise control – it’s awesome having it on a sub $30k car, but even better the adaptive cruise stays on when you change gears. I’ve only seen this once before, in the Honda Type R, and it’s so good to see this work properly. Adaptive cruise itself in the Swift Sport is the same as any other car, and works just as well. To even have it in the mid-spec model is incredible. Huge ups to Suzuki for doing this. So it’s a manual gearbox, but for some reason there’s no Hill Start Assist. I don’t have any issues with hill starts with a handbrake, but hill start assist would have been nice at times. Weirdly, the auto model of the Sport has hill start assist – go figure that one out. Visibility out of the car is on the most part pretty good, except for the chunky C pillars. They are pretty wide, and this really comes into play when you are backing out of an angle car park. There’s a lot of back and forth, trying to see if any cars are coming. I know it’s only a $28,500 car, but it would have been nice if all the electric window switches on the driver’s door were illuminated, and also only the driver’s window has auto function, and it’s only auto down. I’m being picky though, I know. Still sitting in the driver’s seat, there’s a driver’s information display (DID), which is always handy, but it’s a bit lacking in some areas. You do get things like a power and torque display, two types of fuel meters, average speed, a clock, and a motion sensor. That sounds like a lot, but I didn’t really use them. The Motion Sensor display is a type of G-Meter display, but with no numbers, and no memory, so it just shows you on a radar type of display how much forward or back, left or right movement the car is in. More importantly in these days of having to watch our speed and not the road, there’s no digital speedo. I really missed this, especially since the main speedo goes up to 260km/h, and so you can imagine the numbers are really tightly packed in there, making it a bit difficult to read at a glance. A digital speedo in the DID is a must. Still on the DID, it’s great that the Sport has SatNav as standard, but a shame that any directions for SatNav aren’t shown in the DID. Also, the current speed limit isn’t shown on the SatNav screen or in the DID. For the weight of the car, the ride is excellent – that word again. I thought for a while it was a bit too jittery, and at times it is. But keep in mind this thing weighs less than a ton, so making it ride as well as it does is impressive. Still on the day to day, there’s automatic headlights, but no auto wipers. No biggie, and hey there are cars we test at $60K that don’t have auto wipers. At least the headlights are auto high-beams, which is a bonus. You’d think with such a short car, the turning circle would be good. It is beyond good, and at just 5.1 metres, U-turns can be done pretty much anywhere. Perfect city car specs, that one. Still on the plus side, wind noise is minimal, ditto road noise, even on the motorway. The engine can be a little noisy, but never obtrusive. No doubt some sacrifices have been made in the sound insulation department to save weight. I found the Swift really low geared, and this showed on the motorway. At 100km/h, the engine is doing 2700rpm. This means great acceleration on the motorway, even in 6th gear. But it does mean a little more engine noise than you might get in a car doing 1,000rpm less at the same speed. Over my week with the car, I managed to get 7.1L/100km out of it, over 300km of mixed driving. Suzuki claims a combined rating of 6.1, so I wasn’t too far off that. You do need to watch the fuel though, as there’s just a 37-litre fuel tank. After a hot-hatch under $30K? Slim pickings, but at least you do have options. The Jazz doesn’t really count as a hot hatch, but I’ve included it anyway. What do we think of it? I can see why there are so many Swifts on the road. 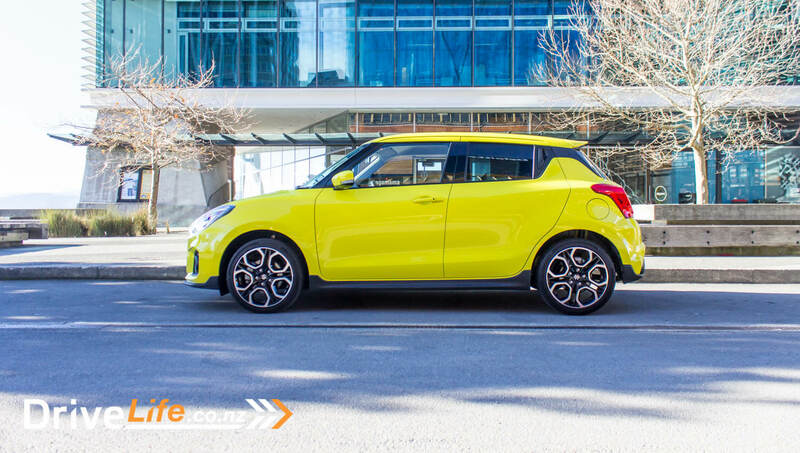 For the money, the Swift Sport is – you guessed it – excellent. 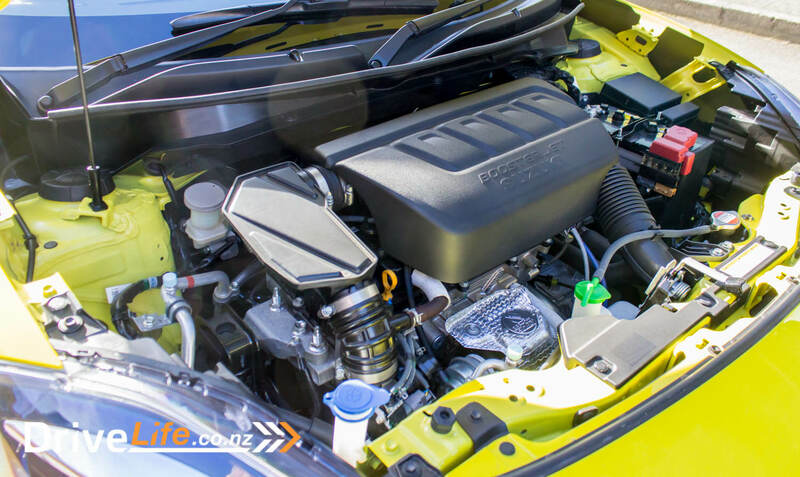 Suzuki’s 1.4 BoosterJet is the benchmark in small-capacity, turbo-petrol motors. So much torque, so smooth, so willing. 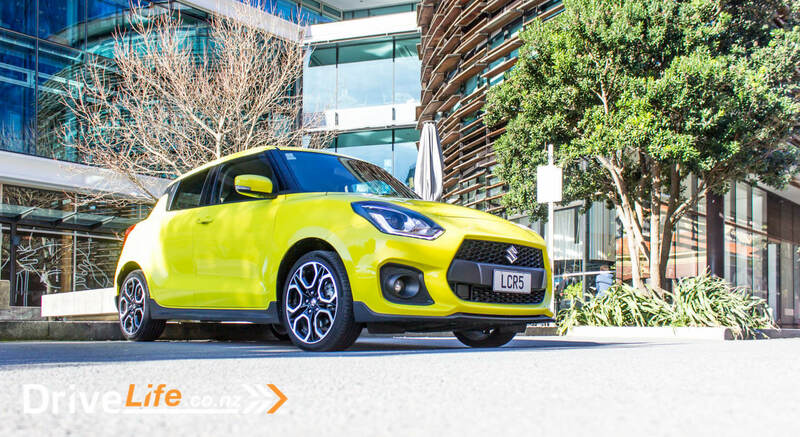 If Suzuki were heading to take the Swift recipe and improve it without breaking anything else, they’ve nailed it on the head. This is the cheapest car I’ve reviewed this year – and I haven’t given a 5-chevron review to any car this year. But the time has come. The Swift Sport in a manual is a brilliant car. No more need be said. 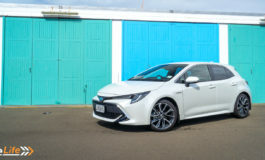 2018 Toyota Corolla Hatch SX - Car Review - Has Everything Changed?